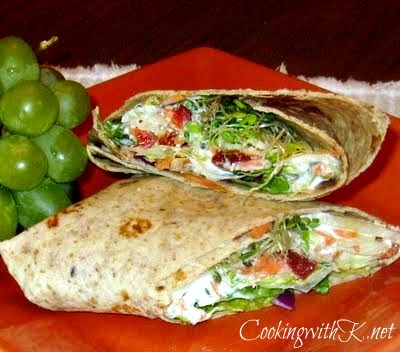 Delicious and loaded with vegetables, the Lite and Fresh Veggie Wraps! These are as good as they look bringing great ideas for a lite lunch or dinner. Shredded carrots, crunchy cucumbers, roasted red peppers, sundried tomatoes, bean sprouts, and the list goes on...with a creamy dressing. Enjoy! In a small bowl mix together mayonnaise, cumin, parsley, garlic powder, salt and pepper; set aside. In the center of the flour tortilla from the top to the bottom, (in the order given) place a small amount of the following items down the center: Lettuce, carrots, cucumbers, peppers, sundried tomatoes, and 2-3 basil leaves. Drizzle a small amount of the mayonnaise mixture on top of the vegetables. Cut cheese slices in half. Put half of a slice of cheese on the vegetables at the top and follow down the vegetables with the other half slice of cheese. Add a small amount of bean sprouts on top of the cheese slices. Take the top of the tortilla and the bottom and fold toward the center, then take the end and roll in a jellyroll fashion. To serve for a main dish,cut in half diagonally, and for appetizers, cut in thirds. Join in the fun here! Mmmmm I love a wrap and all the veggies. Yummy! Thanks for sharing at Church Supper! another fabulous recipe! This looks delicious! I would love it if you would share this and/or any other projects you have been up to at Tuesday Talent Show at Chef In Training Tomorrow! Plus there is going to be a fun giveaway too! Thanks so much and I hope to see you there! Hi! Following you now from the Jam Hands blog hop. 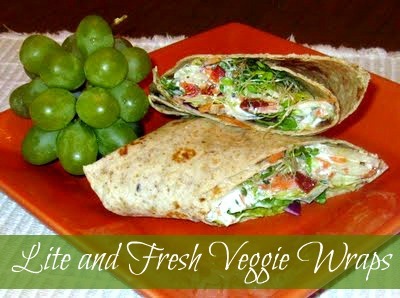 I clicked your photo because I LOVE wraps, especially veggie ones. This looks awesome, I will definitely print this up to try. Thanks! Yummy! Another great recipe! Such a yummy looking image! I'm such a picky eater, I'd have to take out about half of the ingredients, but it does look yummy and so fresh! I am so glad I came across this post over at Chef in Training! I pinned this recipe. We have company coming from London next week who is a vegetarian and this will be perfect!!! Thanks for sharing. Sounds sooooo yummy. Maybe trying that very soon. These would be perfect to include on a picnic or BBQ, I love to have some "grab and go" food for the little ones and these would be great, thanks for sharing and linking with the Hearth and Soul Hop. thanks for sharing this, i've been looking for so yummy but healthy recipes. This looks so delicious and healthy! We would love for you to share this at our weekly link party this Saturday. We have an awesome jewelry giveaway going on right now, too! Come stop by! Kay your Fresh Veggie Wrap has the greatest flavor combination. It looks delicious! Hope you have a wonderful holiday week end and thanks so much for sharing with Full Plate Thursday. Another extremely tasty recipe! Thanks so much for linking up to Tuesday Talent Show! I would love to have you stop by and link up again tomorrow with more great projects! YUM! The veggie wrap looks amazing, and I need lite! All this rain and cold and staying indoors and eating, has taken it's toll. Lite is good.